I have written about caffeine before. It is a wonderful chemical with many roles in nature including acting as an attractant for pollinators and as a protection against pests and pathogens. That it also helps us wake up in the morning is just one of those wonderful connections with nature! A recent paper published in the Proceedings of the National Academy of Science (September 20, 2016) describes the biochemical steps and controlling enzymes by which a diverse set of plants synthesize caffeine. 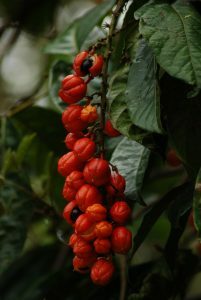 The plants included coffee, tea, cocoa, citrus (specifically orange trees), and guarana (a climbing vine native to the Amazon Basin that makes fruit incredibly rich in caffeine (pictured to the left)) (Guarana, by the way is used in a variety of energy drinks including Monster, Full Throttle and Red Bull!). The authors of this paper found that there are subtle metabolic differences between some of these caffeine producing plants. Coffee and tea, for example utilize the same basic biochemical synthesis pathway to make their caffeine except for their final enzymatic step. They also found that there are some very large differences in some pathways. Cocoa, orange and guarana, for example, not only start their synthesis processes with different substrates but also generate very different intermediate molecules on their way to making caffeine. Their conclusions were that these plants, which are very distantly related to each other, evolved their caffeine synthesizing pathways independently of each other. This type of evolution is called “convergent evolution.” Its occurrence emphasizes the utility of caffeine as a plant secondary compound. This research also emphasized that MANY plants are potential sources of caffeine. This may be very significant considering what our next set of papers and reports are very clearly telling us. Climate change has, unfortunately, become more of a political topic than a scientific one. The sad consequence of this is that the political acrimony associated with the debate clouds the reality of the scientific observations of global warming and prevents the taking of any real steps by which the on-going heating of our planet might be delayed or even reversed. A report (“A Brewing Storm: The Climate Change Risk to Coffee”) published in September 2016 by the Climate Institute (an Australian non-profit organization) explored the impact of climate change models on the global distribution of coffee trees. They found that projected rises in global temperatures would reduce coffee producing land areas by 50% by 2050. Impact of climate change (which includes not only rising average temperatures but also changes in weather patterns and cycles of drought and excessive rainfall) were especially severe at low latitudes and low altitudes. The worldwide, tropical “bean belt” will need to move out of the afflicted tropical zones and up mountainsides in order to find suitable sites to grow coffee. It is estimated that there are 120 million people in these zones whose economic livelihoods depend on coffee. 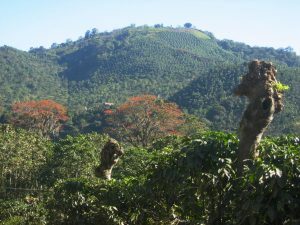 Coffee trees need very stable environments to grow and thrive. This has been one of the ongoing arguments in favor of planting coffee trees under a taller, cover forest. The micro-environment of these “shade coffee” sites are much more stable and predictable than open growth coffee plantations. This how wild coffee grows in its natural ranges in Ethiopia. This is also how most coffee was grown until the mid-Twentieth Century when sun-tolerant varieties of coffee were developed. These great, open, single crop plantations of sun-tolerant coffee produced higher bean yields but at the cost of increased demand for fertilizers and pesticides, increased soil erosion, and the catastrophic loss of forest habitats especially for birds. The recent awareness of the multiple benefits of shade coffee have included not only an economic side (lower production costs), an ecological side (establishment of complex habitats for birds and other animals), but also an aesthetic side (shade grown coffee tastes better!). Climate change, though, is too much even for these coffee ecosystems! 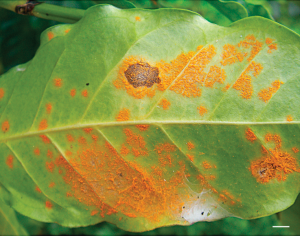 Plant diseases are already ramping up on the edges of the global “bean belt.” In 2012 almost half of the coffee plantations in Central America were afflicted with the “coffee rust” fungus, Hemileia vastatrix. 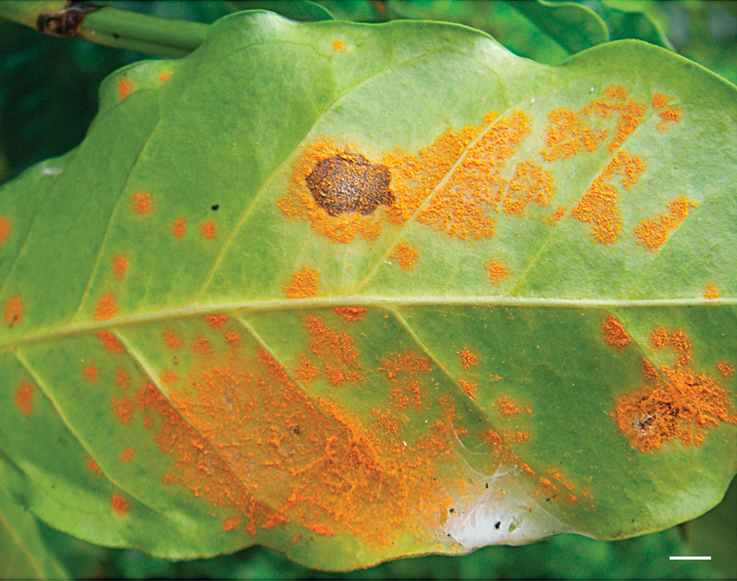 Coffee rust is a disease native to East Africa that has spread to all coffee producing countries around the world. It grows and disperses explosively in warm, wet environments (just the environmental conditions predicted by climate change models). Coffee rust has already reduced Guatemala’s coffee production by 85%! The coffee borer beetle (Hypothenemus hampei) is also a currently significant pest that causes hundreds of millions of dollars of damage to coffee beans. This beetle is originally from Angola but spread early in the Twentieth Century to the rest of Africa and is now afflicting coffee trees in South and Central America and even Hawaii. The moister conditions of a world altered by climate change will allow this beetle to spread even more rapidly through a plantation and across broad geographic areas. 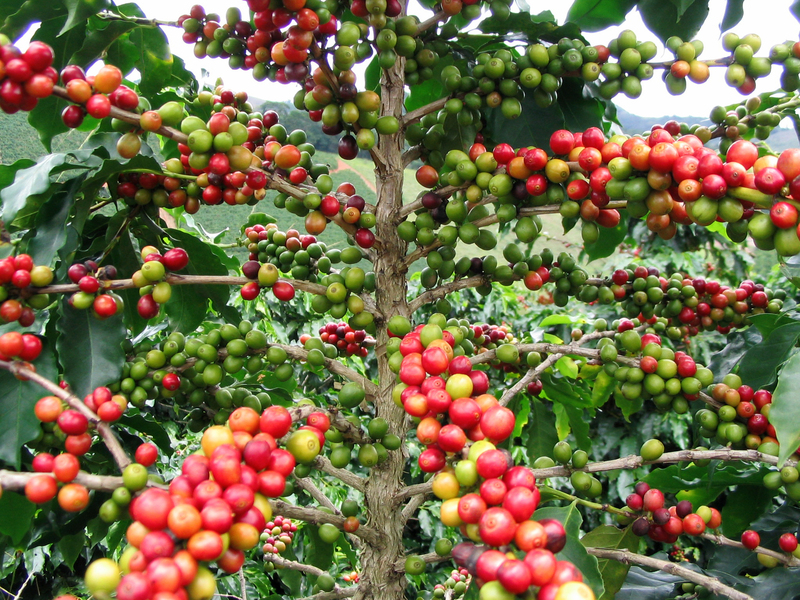 Coffee production is an important part of the economy of Tanzania. Temperatures, though, in Tanzania have been rising since the middle of the Twentieth Century and each degree of temperature rise has been correlated with a decline in coffee production. Coffee production in Tanzania has gone down by 50% since 1960 and is projected to be only a minimal part of the country’s agricultural output by 2060! As I mentioned above, wild coffee (“coffea”) is a shrub native to Ethiopian cloud forests. There are a number of species of coffea found throughout Africa (including Madacascar and Cameroon), but the origin of our coffee trees are probably from the Ethiopian plants. Another consequence of climate change is that these coffea shrubs are very likely to become extinct before we get to the end of our current century. The loss of this genetic information could be devastating to the future of our cultivated coffee trees. We can make caffeine in a factory, and we can cultivate some of the other types of plants to make caffeine rich infusions and beverages. I would prefer, though, a world in which we can still get a real cup of coffee.